This time of year I notice gaggles of interesting summery recipes on Twitter, Facebook, Pinterest and Instagram. I always make a note in my head to remember, when in reality I never do. Sometimes I think of them; but can't find the site to learn the details I need. One twitter friend suggested Evernote, a free app that I downloaded. Only I don't know how to use it, yet. When the time comes to cook I never seem to have a recipe handy and this is my attempt to put all those tasty links into one spot. My usual morning routine is a green smoothie made of spinach, berries, chia seeds and almond milk. This Low Sugar Green Smoothie includes all fruits and vegetable without any milk. Cutting out the milk, would cut out on sugar. This one was hard to categorize; is the sweet granola breakfast, snack or dessert? My friend Bob Vivant creatively appeals this Malted Chocolate Granola to you as she describes swarming bees outside her house. Another way to start the day with an indulgence is Feast for all Season's Blueberry Breakfast Cookies. With quinoa, flax seed and blueberries it carries healthy vitamins to provide energy - not a bad way to start the day. 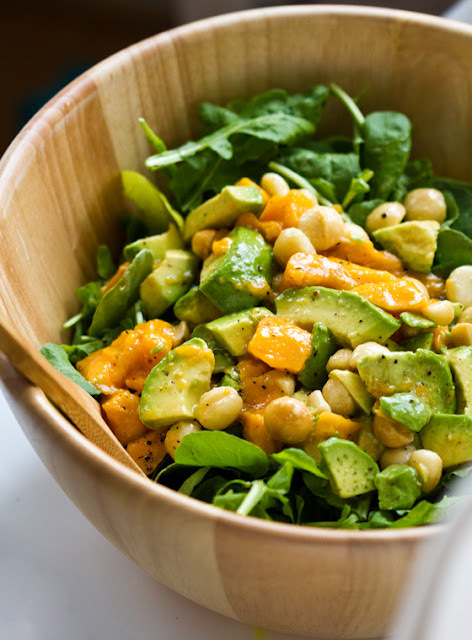 This Grilled Chicken, Mango and Avocado salad reminds me of this Arugula Mango Avocado Salad although they are not the same they are equally fresh and delicious. I made this Zesty Lime Shrimp and Avocado Salad last summer and am waiting for the perfect moment to indulge in it again. Do you sense an avocado theme? A little of the creamy vegetable takes a salad from boring to exotic. Moving away from avocado, but sticking with the fruit and vegetable combo try Tasty Kitchen's refreshing Poppy Seed Citrus Salad. As an effort to fall in love with beets, this Roasted Beets Salad seems to be an easy foray into the world of the bright red vegetable that has many redeeming qualities. My husband and I often order ceviche when we dine out. I've never been brave enough to prepare on my own, but this Ceviche dish from Recipe Girl looks simple and makes my stomach growl. I need to try these Triple Sprout Spring Rolls; a cooling, crunchy pass around hors devours for a party. If you don't want to feel left out at the next BBQ, try these hearty Tempeh Burgers. Also, The Pioneer Women posted an ironically light cheesy Enchilada recipe. Veggie Quinoa Pasta are carbs that are good for you. The quinoa boasts 9 essential amino acids and magnesium that helps lower blood pressure. My friend Tiffany sent me this recipe for Summer Squash and Brie Sandwiches from The Whole Foods website that could also be for lunch, but are too beautiful to eat alone. A simple Strawberry Yogurt treat is a great way to use the mint taking over my garden. Another strawberry sweet that looks like an elegant desert is Lime Posset with Strawberry Lime Gelato and would be perfect for company on a summer night. The next time your in-laws are in town or you finally invite your neighbors over for a meal; here is a list you can refer to for inspiration and ideas. Please share your own favorite summer dishes in the comments below or on Ups and Downs of a Yoga Mom's Facebook page. Thanks for the shout out Beth. This is a fantastic idea for a post. So excited to have those yummy looking blueberry breakfast cookies on my radar. Can't wait to try them. Panzanella is at the top of my summer favorites list. And just about anything made from beets is up there too. Happy summer cooking! Thanks for commenting, Bob! Dare I say I've never tried panzanella? I will have to add it to the list. What do you classify your granola as... dessert, breakfast or snack?